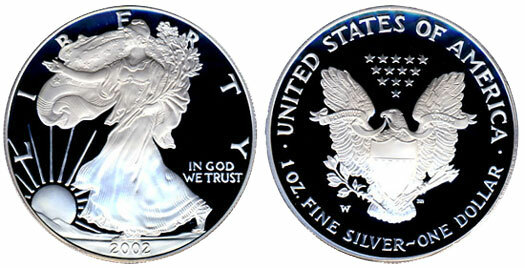 The 2002 Silver Eagle showed an increased mintage from the prior year by over 1.5 million. This brought the total above the 10 million mark for the first time in fifteen years. This would prove to be a temporary peak, as the mintage did not reattain the mark for another four years. Sales of the collectible 2002 Proof Silver Eagle began at the US Mint on June 5, 2002. The coins were limited to a maximum authorized mintage of 750,000 and priced at $24.00 per coin. Once again regular production for Proof Silver Eagles took place at the West Point Mint with coins bearing the “W” mint mark. For the first time in several years, the Mint did not sell out of the full authorized mintage. The final sales tally for the coin was 647,342. Certified coin collectors will find a larger number of perfect graded proof coins in both NGC PF 70 Ultra Cameo and PCGS PR70DCAM. Perfect graded bullion coins are readily available in NGC MS 70, but more scarce in PCGS holders. The overall average price of silver during 2002 was $4.60 per ounce. Throughout the year, silver traded in a relatively tight range between $4.40 and $5.10.